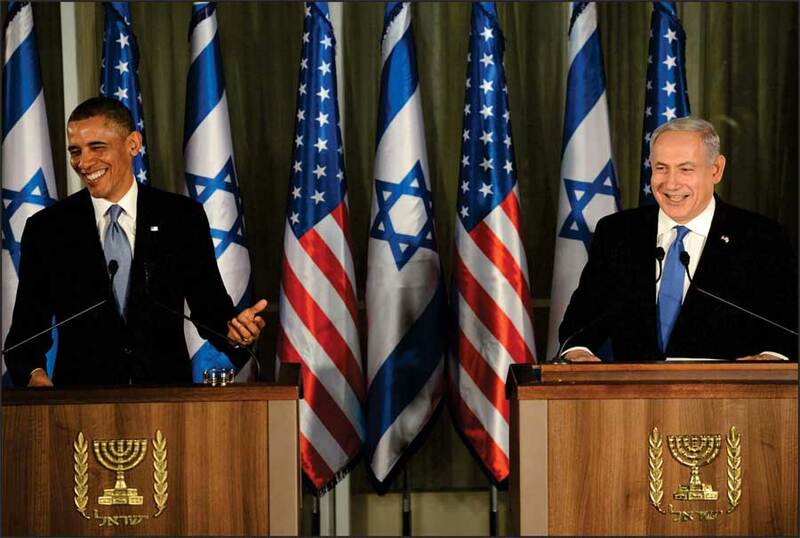 United States President, Barack Obama (left) and Israel�s Prime Minister, Benjamin Netanyahu, during their joint press conference at the Prime Minister's residence in Jerusalem. PM Netanyahu: Mr. President, Barack, it�s a great pleasure for me to host you here in Jerusalem. You�ve graciously hosted me many times in Washington, so I'm very pleased to have this opportunity to reciprocate. I hope that the goodwill and warmth of the people of Israel has already made you feel at home. PM Netanyahu: We had an opportunity today to begin discussing the wide range of issues that are critical to both our countries. And foremost among these is Iran�s relentless pursuit of nuclear weapons. Mr. President, you have made it clear that you are determined to prevent Iran from developing nuclear weapons. I appreciate your forthright position on this point. I also appreciate that you have noted -- that you have acted to thwart the threat both through determined diplomacy and strong sanctions that are getting stronger yet. Notwithstanding our joint efforts and your great success in mobilizing the international community, diplomacy and sanctions so far have not stopped Iran�s nuclear program. And as you know, my view is that in order to stop Iran�s nuclear programs peacefully, diplomacy and sanctions must be augmented by a clear and credible threat of military action. And you said earlier today, the essence of the State of Israel, the essence of the rebirth of the Jewish state is we've fulfilled the age-old dream of the Jewish people to be masters of our fate in our own state. I think that was a wonderful line that I will cherish because it really gets down to the essence of what this state is about. That is why I know that you appreciate that Israel can never cede the right to defend ourselves to others, even to the greatest of our friends. And Israel has no better friend than the United States of America. So I look forward to continuing to work with you to address what is an existential threat to Israel and a grave threat to the peace and security of the world. Let me conclude, Mr. President, on a personal note. I know how valuable the time and the energy is of the American President, of yourself. This is the 10th time that we have met since you became President and since I became Prime Minister. You�ve chosen Israel as your first venue in your visit, your foreign visit in your second term. I want to thank you for the investment you have made in our relationship and in strengthening the friendship and alliance between our two countries. It is deeply, deeply appreciated. You�ve come here on the eve of Passover. I've always considered it as our most cherished holiday. It celebrates the Jewish people's passage from slavery to freedom. Through the ages it has also inspired people struggling for freedom, including the Founding Fathers of the United States. So it�s a profound honor to host you, the leader of the free world, at this historic time in our ancient capital. Mr. Prime Minister, I want to begin by congratulating you on the formation of your new government. In the United States, we work hard to find agreement between our two major parties. Here in Israel, you have to find consensus among many more. And few legislatures can compete with the intensity of the Knesset. But all of this reflects the thriving nature of Israel�s democracy. As Bibi mentioned, this is our 10th meeting. We�ve spent more time together, working together, than I have with any leader. And this speaks to the closeness of our two nations, the interests and the values that we share, and the depth and breadth of the ties between our two peoples. As leaders, our most solemn responsibility is the security of our people -- that�s job number one. My job as President of the United States, first and foremost, is to keep the American people safe. Bibi, as Prime Minister, your first task is to keep the people of Israel safe. And Israel�s security needs are truly unique, as I�ve seen myself. In past trips I visited villages near the Blue Line. I�ve walked through Israeli homes devastated by Hezbollah rockets. I�ve stood in Sderot, and met with children who simply want to grow up free from fear. And flying in today, I saw again how Israel�s security can be measured in mere miles and minutes. As President, I�ve, therefore, made it clear America�s commitment to the security of the State of Israel is a solemn obligation, and the security of Israel is non-negotiable. Today, our military and intelligence personnel cooperate more closely than ever before. We conduct more joint exercises and training than ever before. We�re providing more security assistance and advanced technology to Israel than ever before. And that includes more support for the missile defenses like Iron Dome, which I saw today and which has saved so many Israeli lives. In short -- and I don�t think this is just my opinion, I think, Bibi, you would share this -- America�s support for Israel�s security is unprecedented, and the alliance between our nations has never been stronger. That�s the sturdy foundation we built on today as we addressed a range of shared challenges. As part of our long-term commitment to Israel�s security, the Prime Minister and I agreed to begin discussions on extending military assistance to Israel. Our current agreement lasts through 2017, and we�ve directed our teams to start working on extending it for the years beyond. I�m also pleased to announce that we will take steps to ensure that there�s no interruption of funding for Iron Dome. As a result of decisions that I made last year, Israel will receive approximately $200 million this fiscal year and we will continue to work with Congress on future funding of Iron Dome. These are further reminders that we will help to preserve Israel�s qualitative military edge so that Israel can defend itself, by itself, against any threat. We also discussed the way forward to a two-state solution between Israelis and Palestinians. And I very much welcomed Bibi�s words before I spoke. I�ll be meeting with President Abbas tomorrow, and I will have more to say on this topic in the speech that I deliver to the Israeli people tomorrow. But for now, let me just reiterate that a central element of a lasting peace must be a strong and secure Jewish state, where Israel�s security concerns are met, alongside a sovereign and independent Palestinian state. In this regard, I�d note that last year was a milestone -- the first year in four decades when not a single Israeli citizen lost their life because of terrorism emanating from the West Bank. It�s a reminder that Israel has a profound interest in a strong and effective Palestinian Authority. And as the Prime Minister�s new government begins its work, we�ll continue to look for steps that both Israelis and Palestinians can take to build trust and confidence upon which lasting peace will depend. We also reaffirmed the importance of ensuring Israel�s security given the changes and uncertainty in the region. As the United States supports the Egyptian people in their historic transition to democracy, we continue to underscore the necessity of Egypt contributing to regional security, preventing Hamas from rearming and upholding its peace treaty with Israel. With respect to Syria, the United States continues to work with allies and friends and the Syrian opposition to hasten the end of Assad�s rule, to stop the violence against the Syrian people, and begin a transition toward a new government that respects the rights of all its people. Assad has lost his legitimacy to lead by attacking the Syrian people with almost every conventional weapon in his arsenal, including Scud missiles. And we have been clear that the use of chemical weapons against the Syrian people would be a serious and tragic mistake. We also share Israel�s grave concern about the transfer of chemical or other weapon systems to terrorists -- such as Hezbollah -- that might be used against Israel. The Assad regime must understand that they will be held accountable for the use of chemical weapons or their transfer to terrorists. We prefer to resolve this diplomatically, and there�s still time to do so. Iran�s leaders must understand, however, that they have to meet their international obligations. And, meanwhile, the international community will continue to increase the pressure on the Iranian government. The United States will continue to consult closely with Israel on next steps. And I will repeat: All options are on the table. We will do what is necessary to prevent Iran from getting the world�s worst weapons.